My honey Magnolia: Muffin Tilda Topper! all women with different hobbies together at the same table to create! tutte donne con diversi hobby riunite allo stesso tavolo a creare! I have embossed all the toppers and cutted with a Spellblinder dies. Stamp:Magnolia Once upon a time"Mini Tilda With Prince Froggy"
Una buona giornata al mare!!! Wow, great creation and original! Thanks for joining us with the challenge anything goes at YMAM. These little muffin tickets are adorable and the muffins look delicious. Thank you for joining us at Magnolia-licious/Wee Stamps challenge. Good luck! How cute are these! Love them! Thanks for joining us at Dutch Dare! A very cute muffin topper. Makes for a lovely table setting. 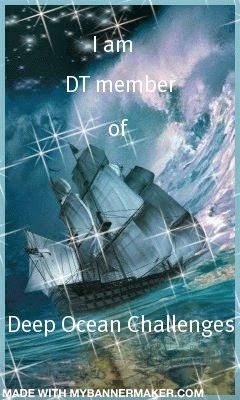 Thanks for sharing at Dutch Dare Card Challenges.